In addition to the above materials of customized badge holders, we also have other customized badge holders, such as metal ID holders. The customized badge holders has two colors, golden and silvery. You can accord your need to choose appropriate one. 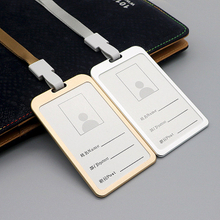 The customized metal badge holders is hard, anti-corrosion and rust anti-proof. Exquisite handling makes metal badge holder looks superior. The metal ID holder also equips with paper print card, different materials and colors of customized lanyard are also provided. We have a variety of accessories for you so that you can match the best ID card pendant. For more customized badge holders, you can browse our product list, every kind of our customized badge holders all have high quality, delicate appearance and beautiful price. Please contact us for more details.